My daughter was married in London in January. It was a small wedding, only 16, so almost all American friends and family couldn’t be there. SO, when my daughter and her husband moved to Boston in August, I seized the opportunity to throw them a stateside wedding party. As little gifts to the guests, we gave a small bundle of allium bulbs – after all what is a better gift in the fall than spring blooming bulbs? As I was wrapping the bundles of bulbs, it occurred to me that planting an allium garden would be a wonderful way to commemorate the wedding. I gathered hundreds of allium bulbs, found a perfect spot in the garden and one recent spectacular fall afternoon, I planted a Wedding Allium Garden. 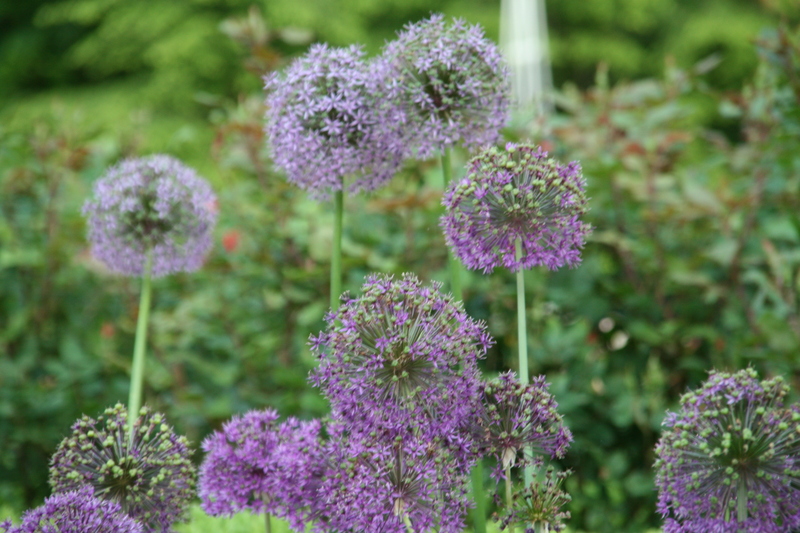 In it are Allium Globemaster, Gladiator, Purple Sensation, Ambassador, Christophii and Shurbertii. Elsewhere in the garden I sprinkled Sphaerocephalon . Alliums are so easy to plant, and so fantastic to have in the spring garden. Since alliums tire out after several years and eventually stop blooming, I plant some every year. But this year was a bonanza year for allium bulb planting. I have confidence that it will be a bonanza spring for alliums. It will be lovely to look at the alliums and remember the joy and fun of the wedding. Bulb planting is not very picturesque so I am not including any photos of bare bulbs or me hunched over with a spade in my hand. But come spring, check back here on Of Gardens to see the pictures of the bounty of alliums. What a wonderful idea to share these beautiful bulbs with guests….and to plant just an allium garden…love the idea. Amy, what a great idea! I can imagine how the alliums next spring will bring back so many good memories of the wedding and the party you’ve just given. I look forward to seeing the photos. Thanks Pat..I’m glad you like my idea.